According to researches, they are one of the oldest living mammals. That’s the reason why researchers love to call them as living fossils. 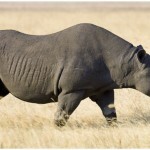 The population of these Rhinoceros dipped to less than 2500 in 2004 but with constant effort of International Rhino Foundation, their population is close to 4500 now. Around ten million years ago, two spices developed from Ceratotheriumneumayri and one of them is Rhinoceros. The separation of black and white Rhinoceros dates back to five million years in their evolution process. Some facts about this creature can be seen below. Black Rhinoceros horns can grow 8cms per year and in Africa, you can find rhinos whose horn length is close to five feet. These horns are main reason for poaching. In the countries like China and Singapore, there is a huge demand for these horns as it is being used in the herbal medicines from long back. Most of the Black Rhinos that are sub-Saharan Africa are killed because of increased commercial demand and they are on the verge of extinction. These horns are very useful in self-defense of rhinos and female rhinos use their horns to protect their kids from wild animals. 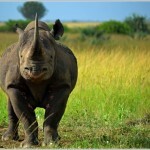 Rhinos play a key role in the increase of eco-tourism in the African countries like Namibia. Rhinoceros love to play in water and they spend most of their in rivers or lakes in Africa. 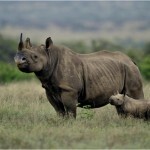 Female Rhinos becomes pregnant once in two to three years and they fed newly born babies on milk. 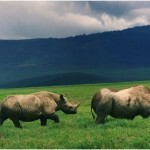 Gestation period in Rhinos is fifteen to sixteen months. More than 50% deaths in male rhinoceros and more than 30% of deaths in female rhinoceros are due to combat injuries only. No man can run faster than Rhinoceros. 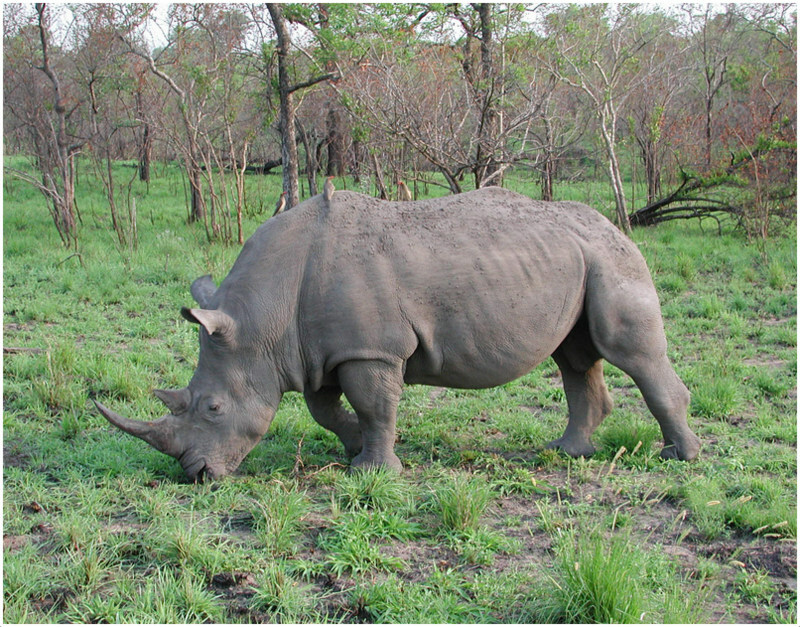 Urine spraying is used as a technique to locate other Rhinoceros. 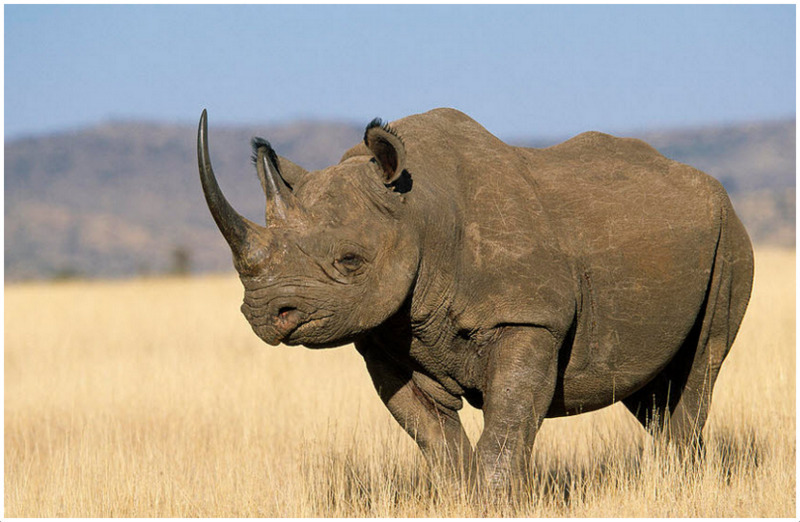 Black Rhinoceros loves to eat 11 trees and they prefer quality over quantity. There is a strong competition between elephants and rhinoceroses and rhinoceroses change their food habits if they feel it compulsory. If you are considering this as pet, make sure you can spend heavily for its feeding. Their feeding requirements are huge and they are vegetarians. They depend on trees and green bushes to get their food and they pluck leaves and flowers from trees. They like to eat more than 200 varieties of trees and they can live up to five days without drinking water which is hard to see in case of other animals. 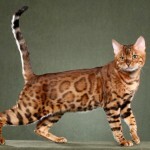 These animals can be found living in a variety of places including forests, woodlands or savannah and even deserts. They also migrate once in a while. 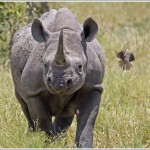 Black rhinoceros has the habit of fighting with other rhinos. Their aggressive nature and combat injuries significantly contribute to their deaths. Males sleep longer (almost double) than females. Most of us don’t know the fact that they can run with a speed of 34mph and this is really great considering their huge size. 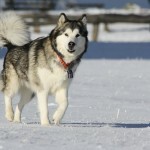 They are adaptable to new surroundings but it is hard to train them. They love to be independent and the mortality rate increases heavily if you keep them under human captivity. They are intelligent and give value to relationships. Strong bonding between mother and the new born calf proves the same. They are known for theiraggressive nature and attacks immediately incase of any suspicious activity. 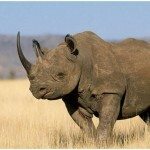 Black Rhinoceros have strong sense of smell. They can easily recognize the missed Rhinoceros just by the scent it left. Their hearing ability is so high and they can even hear sounds that are not heard by humans. 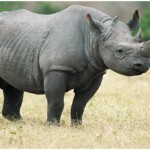 The first thing that comes into any one’s mind after hearing the word black rhinoceros is its huge strong body. Their body is muscularbut their vision capabilities are poor. 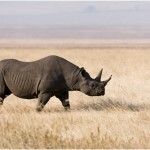 Rhinoceros are on the verge of extinction. 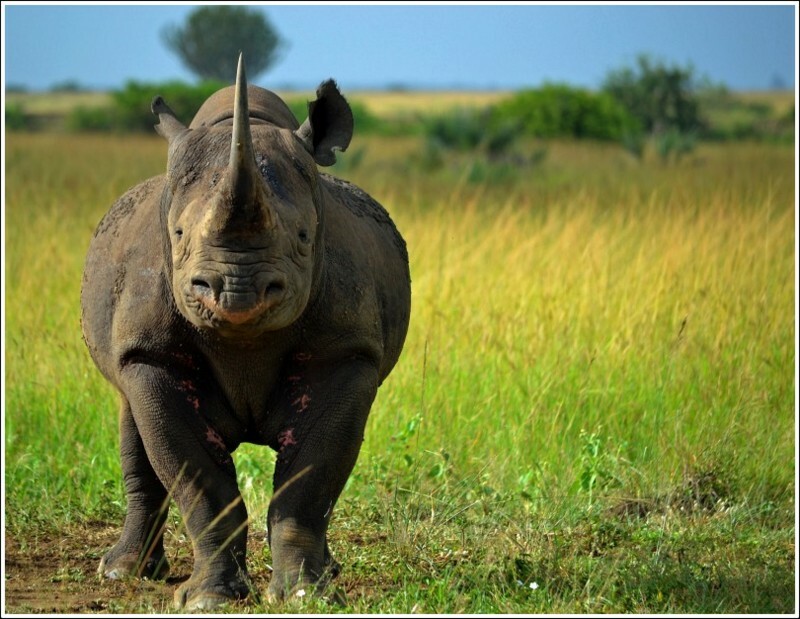 As per 2013 statistics, the total number of Black Rhinoceros that are living on this planet is less than 5000. They are in critically endangered category and several African countries are trying topreserve them. 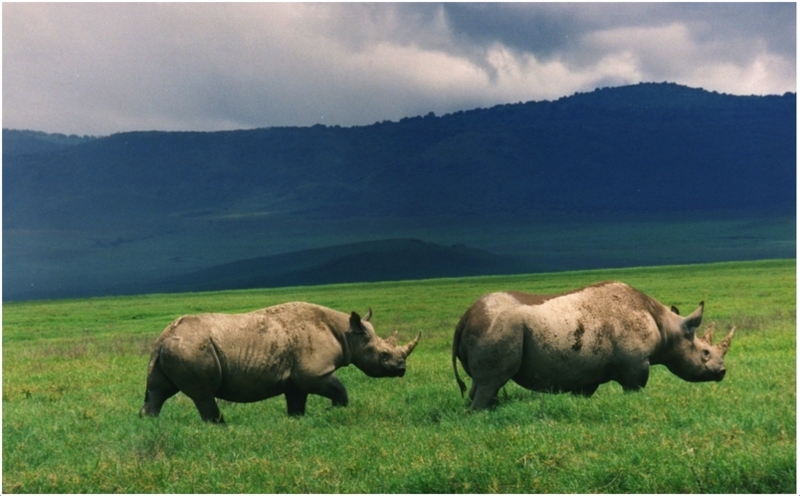 The land reserves assigned to protect Black Rhinoceros are often attacked by land less farmers in African countries. After breeding, the rhino will stay with its mother until it matures and has its own off spring. When this happens, they leave to start their own family. Being as big as they are, these animals face minimal danger. The main predator is the wildcat. They tryto avoid coming into contact with humans and civilization. 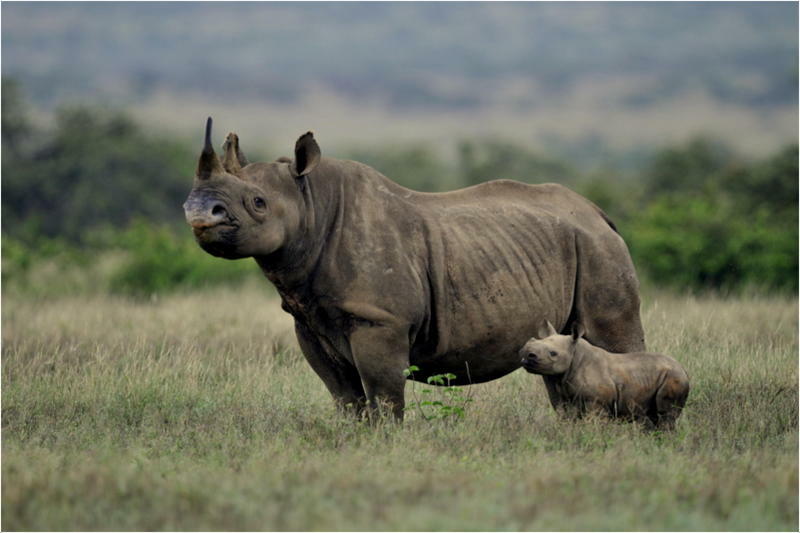 Breeding occurs all year round.The black rhinoceros has an average of one off spring per breeding. It occurs often on the summer time. The hooked lower lip is the main reason for getting the name Black Rhinoceros. There is one more variety of Rhinoceros living in Africa, known as white Rhinoceros. The word white has nothing to do with its original color and unlike black rhinoceros its lips are square shaped. 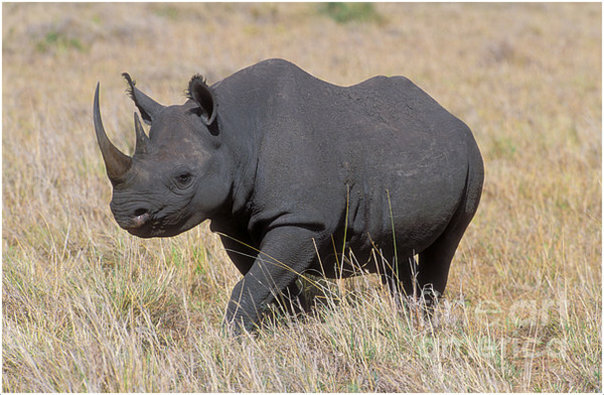 Black Rhinoceros can grow up to 1.8mts.They weigh in between 1,760 to 3,080 pounds (800 to 1400 kg). 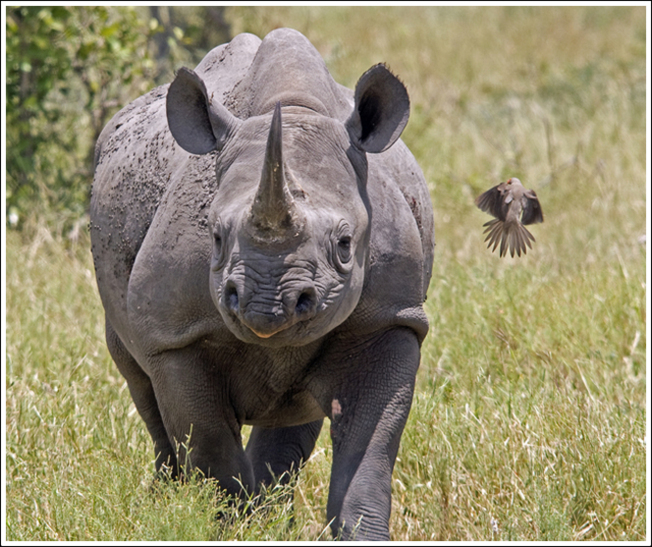 At the time of birth, Black Rhinoceros weigh 35-50kgs. Whatever the variety may be, Rhinoceros can be seen only in gray color. 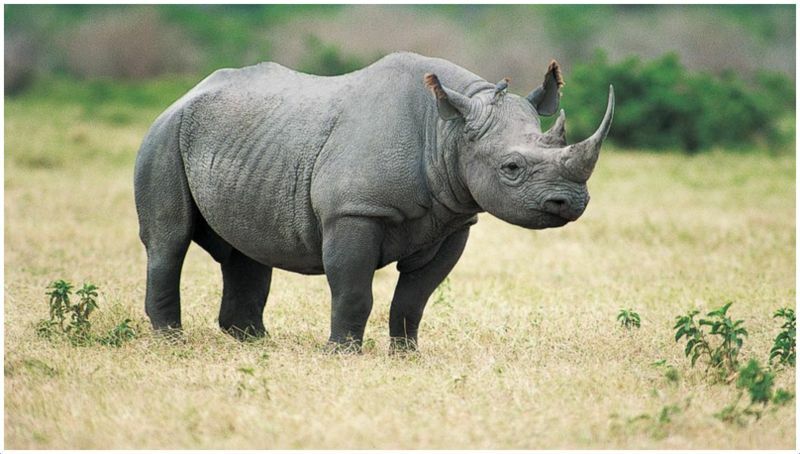 The word black in Black Rhinoceros doesn’t represent the color of the rhino. 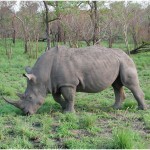 Brown shaded gray rhinoceros can also be seen in the Kenya regions. 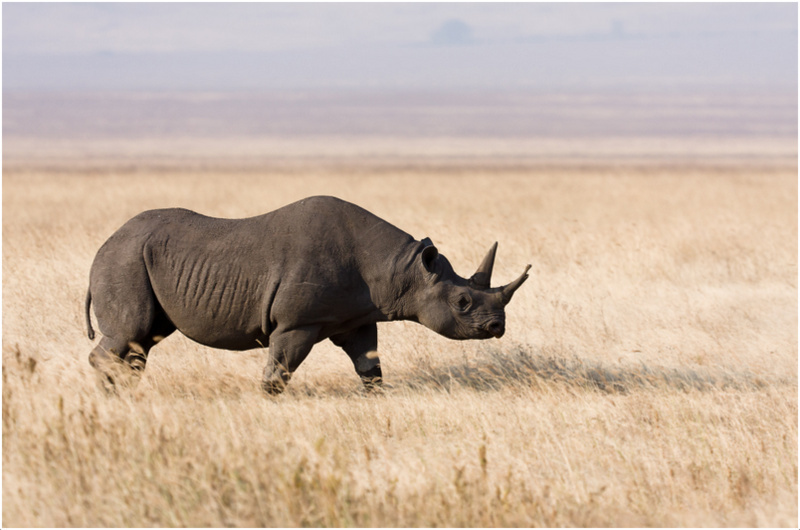 Because of its thick skin, black rhinoceros can easily walk in regions where shrubs and thorny plants are present. These animals can live up to about 50 years. They maximize their life time by trying to avoid danger. Depending on their habitat, the life span takes longer in the ones that live in forests. 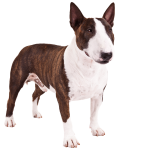 Health relatedproblems are rare in Rhinoceros and they can liveup to fifty years happily without any problems. Wild life perfectly suits them and they are more prone to health problems and diseases if they are present in human captivity. Black Rhinoceros are hard to groom. As they are not considered as pets, no professional grooming center offers grooming services to Black Rhinoceros. Shedding of salmonella is seen to occur more on rhinos in captivity as compared to those in the wild. In the wild, it is easier for them to avoid getting the salmonella. This helps them live longer. 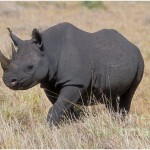 Its full name is Black Rhinoceros. 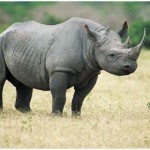 Hoop lipped rhinoceros is the commonly used name in Africa. 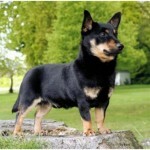 They are native to eastern and central Africa. They are of huge size. They belong to Dicerosbicornis group. It is intelligent and aggressive. Male Rhinocerosalso grows same size and its height is also close to 1.8mts. They weigh 1,760 to 3,080 pounds (800 to 1400 kg). 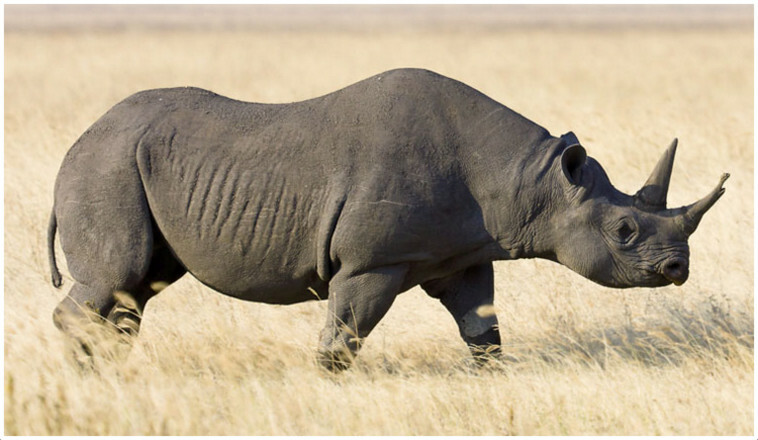 Only gray color rhinoceros can be seen. 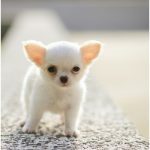 It is hard to buy them as pets but one can donate for their conservation.